The transport sector is the backbone of the European economy, moving people and goods into and around Europe. 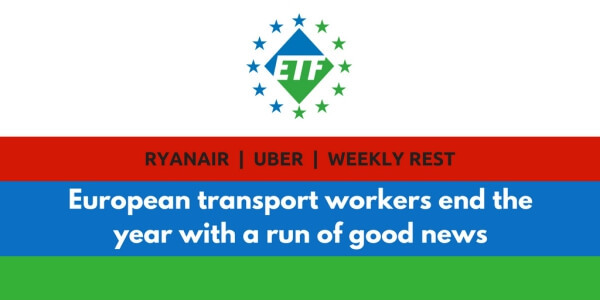 And transport depends on its workers – including the 5 million represented by ETF’s affiliate unions. Sadly, the quality of some jobs in the transport sector is under attack. We see poor conditions, low pay, bogus self-employment and social dumping – on the roads, on the rails, on the sea and in the air. But it doesn’t have to be this way. The transport sector could and should create decent work for millions. That is why it is so pleasing to end the year with three pieces of good news, which show how decent work in the transport sector can be defended and extended. Firstly, Ryanair has made a huge u-turn and agreed to recognise staff unions. We now expect them to deliver on this promise and negotiate in good faith with all categories of staff representatives across their network. The entire low-cost airline sector needs to look hard at its employment practices, especially the excessive use of agency staff. Secondly, the European Court of Justice has ruled that long-distance drivers cannot spend their weekly rest period in their vehicle. Forcing drivers to sleep in their trucks or coaches is a way to employ and exploit drivers from cheaper countries – a form of social dumping at the heart of many companies’ business models. This decision raises hopes that we can build a Mobility Package which offers meaningful protections for professional drivers. And finally, in another excellent decision, the European Court of Justice has ruled that Uber is a transport company – not just an information sharing platform. This means that Uber will be covered by the same national rules as taxis, and should give those who drive for Uber better rights and protections. This ruling could have impact across the entire “gig economy”, and offers hope that we can harness digital innovation to create quality jobs, not precarious employment. Ending the year with this momentum means we will hit the ground running in 2018. We will be keeping an eye on the impact of these developments – making sure that employers and policymakers deliver for Europe’s transport workers. But before that there is time for a little break. We wish all our affiliates, and all Europe’s transport workers, a very happy holiday. See you in January!